In this essay Mulla-Carrillo compares the way belly-dancing has been viewed in Eastern and Western societies, shedding light on how Islamophobia impacts the practice of belly-dancing today. Sumaya Mulla-Carrillo is a dance major at Cornish College of the Arts, originally from San Jose, CA. Images of Middle Eastern dance consist of forbidden and exotic women wearing lavish costumes. In popular culture, belly dancers from Egypt, Iran, and Saudi Arabia exude an air of mystique and intrigue. They draw the audience into their fluid hip and shoulder movements, while simultaneously being unapproachable and taboo. This perception of belly dance has been shaped by a history of religious fundamentalism promoting patriarchal values. Although belly dancing originated as a social and celebratory dance, it later became forbidden in public spaces because of restrictions on viewing women’s bodies. As Middle Eastern cultures spread around the world through a diaspora, so did the practice of belly dancing. Modern day practices of belly dancing can be culturally authentic, or present the dance as a cabaret type performance for entertainment. The cultural and sexual connotations of belly dancing mean it is banned in some places, while simultaneously embraced as a way to reclaim sexual expression and cultural identity in other places. Belly dancing is one of the most recognizable dances rooted in the Middle East, seen commonly in both Western pop culture as well as practiced in private cultural gatherings. It is traditionally a female solo dance performed at family gatherings and performance venues in North Africa and the Middle East (McDonald and Sellers 4). Belly dancing has a long history, and is one of the oldest cultural dances of the Middle East. It is thought to have originated as a part of religious ritual before the rise of Judaism and Christianity. Female goddesses were celebrated as givers of life in the near east and “female deities were often represented in the figures of mothers” (AlZayer 72). Much like stories that are passed down orally through generations, the movement vocabulary of belly dancing that celebrated these powerful maternal figures were taught informally from mothers to daughters. These early versions of belly dancing would have been performed by women alternating with solo dances in social and religious settings. Current perceptions of belly dance as forbidden are shaped by the influence of patriarchal religions and the cultural values that followed. The Abrahamic religions- Judaism, Christianity, and Islam- all helped eradicate the goddess centered worship that was widespread in the ancient Middle East. By the time Islam became a powerful religion in the Middle East, around 600-700 CE, women’s bodies were hidden away instead of being celebrated publicly (AlZayer 72). As Islam spread, women were told to be modest outside the home. A translated verse in the Quran specifies these instructions. This verse is interpreted many ways throughout the Muslim world resulting in the variations of headscarves worn by Muslim women. Different interpretations of how women should portray modesty can range from trying to practice the spirit of modesty without altering clothing, to strict full body physical coverings such as the burqa or the niqab. Generally, women are permitted to remove their hijab in private, in the presence of their husband and other family members. Women’s bodies in Islam are not for public display or attention, as described in this verse of the Quran. In a by-the-text interpretation, this would prohibit female dance performances, especially belly dancing which is considered by spectators to be sexually suggestive. The rise of Islamic fundamentalism in the Middle East, prompted by patriarchal cultural ideals led to a stigma against revealing women as sexual beings in the public eye. Given that belly dancing was commonly performed in celebrations such as weddings and births, the religious interpretation forbidding public dance performances is at odds with cultural practices in places like Egypt and Saudi Arabia. From the 1900s until today, community celebrations provide “many occasions for women to get together to relax and socialize… there is no clear division between audience and performer because they take turns dancing” (AlZayer 73). Due to the tradition of transmitting belly dancing movement in private gatherings of only women, censorship of the dance under fundamentalist regimes did not impact its transmission between generations. Particularly in Egypt, “In spite of [belly dance’s] representation as a performance that entails an overt display of feminine sexuality, this never hindered its transmission and practice within Egyptian homes and in intimate contexts” (McDonald and Sellers-Young 21). The practice of belly dancing in a social environment was, more than ever, by females for the enjoyment of other females. By removing the dance from public performance and from the male gaze, belly dancing became a dance of shared community and a source of joy among women in private. Another result of restricting belly dance in its countries of origin was the growing Western popularity of the dance. Condemned by Islam, belly dancing was one of the few secular representations of Middle Eastern culture that could be shared in the Americas. It was first seen in the United States in the 1893 World’s Fair, and audiences were “fascinated by the exotic entertainers from the East” (AlZayer 74). The subtle swaying and twisting of the hips in belly dance was drastically different from American forms of dance. The unique movement vocabulary as well as knowledge that women had restricted freedoms in the Middle East led to a fascination with Orientalism. Although it was inaccurate, the myth of “belly dancers as seductive ladies of the harem dancing for the sultan” (AlZayer 74) was perpetuated by Hollywood and other popular representations of belly dance. Perceptions of belly dancing in the West celebrated the female body as a sexual object, and the purpose of the dance was to show off bodies in a way that alluded to their mysterious nature. Belly dancers in the midst of performance provoked ideas of sin and sexuality, and inspired many choreographers to reference their movement in other dances. The rise of Orientalism in the United States allowed Hollywood and other choreographers to reshape belly dancing. Many of the common costume choices for belly dance seen in both Hollywood, and later on, Bollywood movies are inauthentic costumes to accentuate the sexual intention of the dance. The costume was changed into a sparkling two piece costume, as seen in Ruth St. Denis’ “Egypt” photograph below. Ruth St Denis “Egypta”. Photograph by Herman Miskin. Other dancers and choreographers who appropriated the aesthetics or the movement of belly dance include Jack Cole in Kismet, Gertrude Hoffman, and even the ballet Scheherazade (Alzayer 76). These dances all focused on the woman as a forbidden, but desirable object. Veils were not used to cover the body, rather they were used for decoration and occasionally became part of the choreography. Women who imitated belly dance were mostly Caucasian, yet they attempted to become more exotic and therefore more appealing to their male audience through elaborate costuming. They also accentuated the Middle Eastern music and set design that usually went along with their dancing. These performances used Middle Eastern aspects of belly dancing to adorn Caucasian female bodies, instead of celebrating women who were truly of Egyptian or Arabian origin. In movies, fairs, and nightclubs all around the Americas, the aesthetics of belly dance was appropriated and praised, while the dancers who created the form remained hidden. Middle Eastern women are working to reclaim belly dancing, despite the fact that belly dancing in Canada and the United States is most visibly practiced by white, middle-class women who connect with the art form as a way to build body positivity,. The late 1990s and the 2000s saw a massive Middle Eastern Diaspora due to political unrest. Arab, Turkish, Egyptian, Lebanese, and women of many other ethnicities found themselves adjusting to North American culture. These women, and second generation immigrants use belly dancing as one way to reconnect with their heritage and to combat cultural and religious stereotypes. By connecting belly dance with Arab, Egyptian, and Turkish identity once again, it becomes a way to empower women and challenge cultural ideas about women’s roles within Middle Eastern culture and Islam (McDonald and Sellers- Young 49). Currently, teachers and dancers within these communities seek to produce a deeper and more nuanced understanding of Middle Eastern and North African culture, music, and history. This struggle between East and West, and religious and cultural messages is one that defines belly dance as a whole. It affects the women who practice belly dancing as they seek to dance for themselves and reclaim their own sexuality and body image. Belly dancing encompasses several conflicting messages about Middle Eastern women and their bodies. Strict adherents of Islam require that women are not seen performing, and attach a stigma to women being seen as sexual beings in any sense. Historically however, the practice of belly dance did not come from a desire to be sexually appealing, rather it came from celebration among communities of women. Once belly dance was exported around the world, these messages got mixed up to create an Orientalist fascination that presented dancers as exotic and desirable but also forbidden. Portrayals of belly dance in movies and by many performance groups in the Americas appropriate the aesthetics while erasing the bodies of Arab women in favor of presenting Caucasian women instead. Despite all this conflict about the connotations of belly dance, it is still widely practiced and Middle Eastern women gladly share it with others and use it to combat negative stereotypes. Belly dancing, and the women who perform belly dancing always have been, and perhaps always will be, caught between cultures. Alzayer, Penni. Middle Eastern Dance. Philadelphia: Chelsea House, 2004. Print. Brooks, Geraldine. Nine Parts of Desire: The Hidden World of Islamic Women. New York: Anchor, 2005. Print. “Islamic Arts.” Encyclopædia Britannica. Encyclopædia Britannica, Inc., n.d. Web. 20 Apr. 2017. McDonald, Caitlin E., and Barbara Sellers- Young. Belly Dance around the World: New Communities, Performance and Identity. Jefferson, North Carolina: McFarland, 2013. Print. Meftahi, Ida. Gender and Dance in Modern Iran: Biopolitics on Stage. New York, NY: Routledge, 2016. Print. Mishkin, Herman. “Ruth St. Denis Egypta”. Photograph. Broadway Photographs. Web. 16 April 2017. Sarony, Otto. 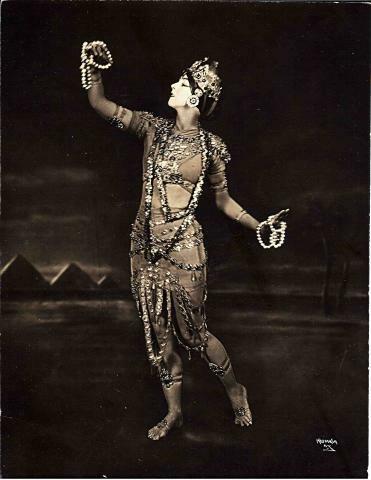 Ruth St. Denis in Radha. 1908. New York Public Library. Pinterest.com. Web. 23 May 2017. Sharif, Keti. Bellydance. Australia: Allen and Unwin, 2004. Print. The Meaning of the Holy Quran. Trans. ‘Abdullah Yusuf ‘Ali. Beltsville, Maryland, USA: Amana Publications, 2009.